Woodbury floral artist shows off her skills at MIA’s Art in Bloom event. “City Night” and Mary Ann Morgan’s floral display. Every spring, visitors flock to the Minneapolis Institute of Art (MIA) for its Art in Bloom event—a beautifully unusual, collaborative exhibit in which local floral artists create arrangements, using fresh flowers, inspired by the paintings, sculptures and other works in MIA’s collection. 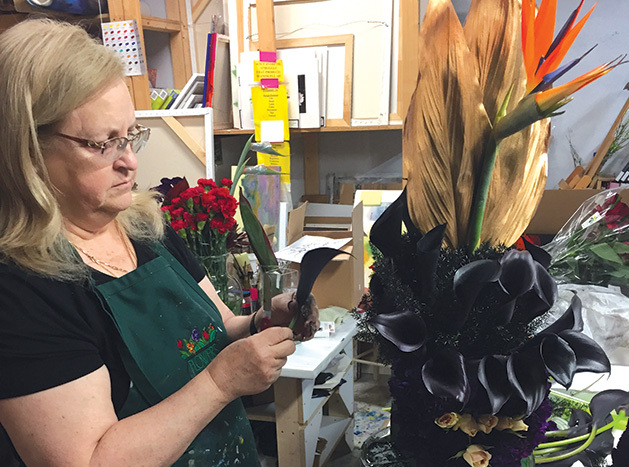 Woodbury artist Mary Ann Morgan has participated in Art in Bloom for the past three years; this year’s show will be her fourth. Morgan says, “The event takes a lot of work … to coordinate 165 artists doing floral interpretations of the collection.” On selection night, the floral artists arrive at the museum with lottery numbers in hand. “When it’s your turn, they call you in groups of 10 to select your piece and officially register your selection as yours,” she explains. Then, it’s off to the races. Morgan puts together her 2018 piece based on Japanese armor.